I came across a group of bloggers here on WordPress who are part of a Stitch-A-Long group of stitchers. A SAL is a group designed to help motivate and encourage us to finish projects one at a time. How many of us have multiple projects, unfinished sitting in a drawer? This group is a great way to motivate everyone to get one project done at a time and I was so impressed by all of their work that I decided to inquire about joining them. To my delight I was accepted into the group so now I write my first SAL post! Thank you ladies for letting me join! My last post on my peacock cross-stitch project was on weeks 1-3. This photo is week 4. It may seem like I am almost done but the entire plume on Miss Peacock has yet to be worked on. Wait until you see how big it is. Yikes! That will take me a while especially with spring gardening in my future. 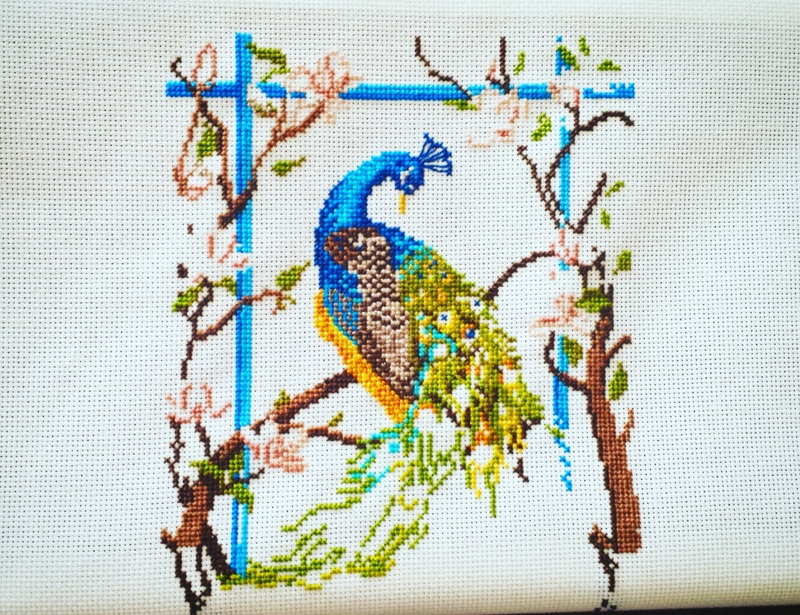 This entry was posted in Cross-Stitching, Project Peacock, SAL, sewing, Uncategorized and tagged Cross peacock cross-stitch, cross-stitch, SAL by marymargaretripley. Bookmark the permalink. Welcome to the SAL. Your peacock is beautiful. Hope you find as much motivation here as I have. This really is a great group of stitchers. Thank you Cindy. I love how talented you all are. Welcome to the sal 🙂 look forward to seeing the peacocks plume. Thank you Jessica. I am very excited to be part of the group! Welcome aboard 🙂 I was trying to be clever, thinking of a name for your peacock. SALLY! How appropriate. Then I realised that would be for a pea-hen oops! How about Salvador? The peacock is soo pretty!